This was hard because I'm not in favour of forgetting. Even moments of my life that have been sheer hell on earth have helped me to be better after. I thought of those videos of yesterday's tsunami ... but no, that should never be forgotten for the same reason that schoolkids for the next 1000 years and beyond should be made to watch Schindler's List. And then I thought of ... no, not the Chicken Song specifically, but every single irritating earworm that has ever got into my head and kept me awake until 4 in the morning. 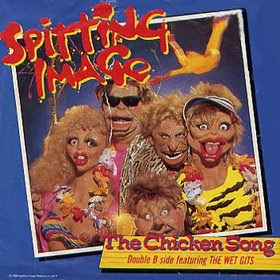 The kind of thing that the Chicken Song lampooned, in other words. In the interests of full disclosure I should probably mention that I too bought a copy of this when it came out. Much funnier was the B-side, I've never met a nice South African.